A new book about climbing in the Lake Tahoe area. Eureka, Nevada, is located on US Highway - also known as the "Loneliest Highway in America." While there are far lonelier roads in Nevada than US 50, the name is still apt since, quite simply, there is very little on US Highway 50 to the east of Fallon. Eureka is one of only two towns on US 50 between Fallon and Ely. For this reason, Eureka often plays host to stranded travelers or those in need of services along the way. 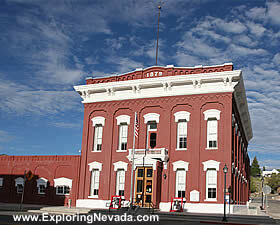 Eureka also has a great location, as it's close to several beautiful Nevada Scenic Drives, including the Monitor Valley Scenic Drive, the Ruby Valley Scenic Drive and the Hamilton Ghost Town Scenic Drive. There are several hotels in Eureka, but only one (the Best Western) is available for online booking. I've stayed in all three hotels, and let me tell you, spend the extra money and stay at the Best Western - it's way nicer and quieter than the other hotels. Oh yeah, the Best Western doesn't smell, either!